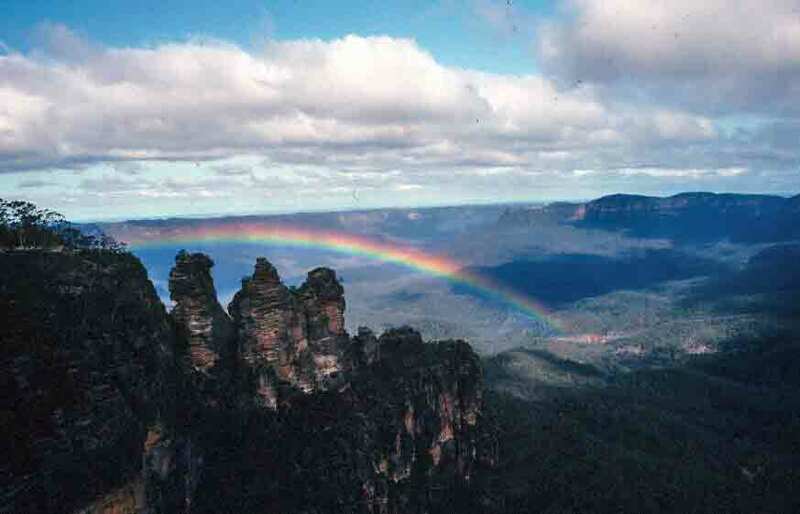 My first visit to the Three Sisters was on my first trip to Australia. However, my favorite photo of this rock formation was from my second trip to Oz. The Three Sisters is a three-peaked rock formation at the edge of the Jamison Valley in the Blue Mountains outside Sydney. On my first visit, it was sunny and there weren’t many people. On my second visit, it was raining lightly and there were buses full of tourists. However, because of the rain, the tourists were all packed into nearby tourist venues, ordering snacks or playing video games. I put my hood up and headed outside alone—and was abundantly rewarded, as you’ll see in the photo below. The Three Sisters, by the way, derive their name from Aboriginal mythology. Back in the time of legend, three sisters went into the forest to forage with the local witch doctor. The girls got tired and decided to stay behind while the doctor headed farther into the woods. They idly threw stones over the cliff, which woke up a mythical carnivorous creature known as bunyip. Hearing the girls’ cries of distress, the witch doctor came running, magic stick in hand. To save the girls from being dinner for the bunyip, he turned them into the three stone pillars that still stand in the mountains. The Three Sisters are worth a visit, as is the entire area surrounding them, even if you do go on a sunny day. But if you happen to be there when it’s raining lightly, perhaps you’ll see what I saw that day. The first impression one may have in reading this blog is that I’ve only been to Australia. My first trip to Australia was a pivotal event in my life, but it was by no means my only trip. I have been to 35 countries on six continents, and have traveled widely in the U.S. My adventures have ranged from high end to exotic to rough and tumble, with accommodations that span the spectrum from elegant hotels to nomads’ tents. As a result, I’ve learned a fair bit about traveling successfully—and I actually get paid on occasions to do presentations on the topic. I thought that, in between travel tales, I’d share a few top tips for making travel easier, safer, healthier, and more find. Today, I’ll introduce two of my favorite products for when I’m on the road. Recommended item number two is Emergen-C from Alacer Corp. Emergen-C is an electrolyte powder that comes in little foil packets. I always have some of these with me, but never so faithfully as when I’m on the road. The pressurized cabins in airplanes are notorious for their dehydrating effect, and while drinking lots of fluids helps, adding some electrolytes is even better, especially on long flights. Then, of course, if your destination is some place toasty, it’s good to have your Emergen-C along there, too. Why Emergen-C? Well, it has twice the potassium of the top sports drinks. It adds stacks of vitamins that help with stress (B vitamins and 1,000 mg of Vitamin C—that’s why that “C” is highlighted in the name), and it’s all natural—no chemicals or artificial sweeteners to hurt you. Just lots of lovely electrolytes and stress vitamins in a yummy, fizzy drink. Of course, because even staying at home can lead to a need for electrolytes, this is not a bad thing to have on hand even when you’re not traveling. You can find it at almost every health food store, camping outfitter, or Whole Foods store. Good stuff. And if you need it, a life saver. Australia is sometimes called the land of the parrot. This is a fair description, as parrots, including rosellas, cockatoos, and galahs, are numerous and close to ubiquitous. The bird life in Australia is one of the great delights of this country—from the mobs of geese, storks, herons in Kakadu to the major migratory flyway near Broome to the birds that one finds everywhere, such as emus and kookaburras. But there is a bird that most people wouldn’t think to associate with the land downunder: the penguin. However, Australia is the first landfall north of Antarctica, and there are large penguin colonies in several places along the south coast. The spot at which tourists are most likely to encounter these wonderful birds is on an island just south of Melbourne: Phillip Island. Every night, hundreds of penguins come ashore here, and are almost always met by a phalanx of eager visitors. The spot has been made increasingly touristy over the years, but it is still absolutely worth going—for the sake of watching the penguins. Shortly after the sun sets the first group of penguins “lands.” There is a shimmer at the edge of the water, a little extra white on a wave, a flip-flash of silver, then a penguin stands up. If there are no other penguins around, it again disappears into the foam. Soon, others arrive. They do not come ashore alone, always in groups—there is safety in numbers. Still, the sea gulls harass the small band trooping up the beach, trying to get them to give up the food they’ve brought for their mates. If a wave comes along, the penguins drop on their stomachs and ride it in. They are undaunted by the crowd that has come to watch them—until someone disobeys the rules and takes a flash picture. The penguins flee for the safety of the water. (And the offender’s camera is confiscated.) In a few minutes, when it appears that the danger is gone, they start back up the beach. By this time, farther down the shore, another group has gathered and is waddling solemnly towards home, and the flash and shimmer of another approaching group can be seen on the crest of a breaking wave. Soon, hundreds of penguins are on the beach—600, it is estimated. There are approximately 1,200 in the colony, but this is the mating and breeding season, so someone has to stay at home and sit on the egg. This job is traded off, with the male and female staying behind on alternate days. As a result, there is a tremendous “social hour” when the penguins return home, and we could hear them chattering and whirring as each related the day’s activities to the other mate. Some eggs had already hatched, and we could see the downy chicks in the nests, waiting anxiously for dinner. 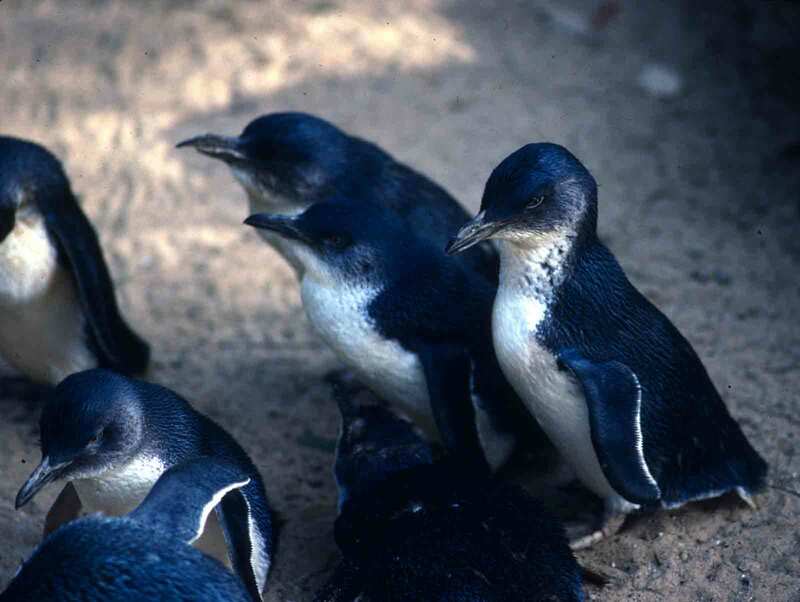 Note that the penguins on Phillip Island are the Fairy, or Blue, Penguins, which, at 13-inches in height, are the smallest variety of penguin. While in South Australia, I visited Kangaroo Island, which is just a short flight south of Adelaide. It was a splendid destination that offered glorious scenery, astonishing wildlife, and splendid natural wonders, from Remarkable Rocks to the extensive Kelly Hill Caves. Here’s an excerpt from my first day on K.I. Kangaroo Island is a fairly large island, nearly 100 miles long and 30 miles wide. The terrain is a combination of lush, rolling, sheep-dotted pasture land; dense scrub; serene forests; wild, rugged, sea-lashed cliffs; and long, peaceful beaches. 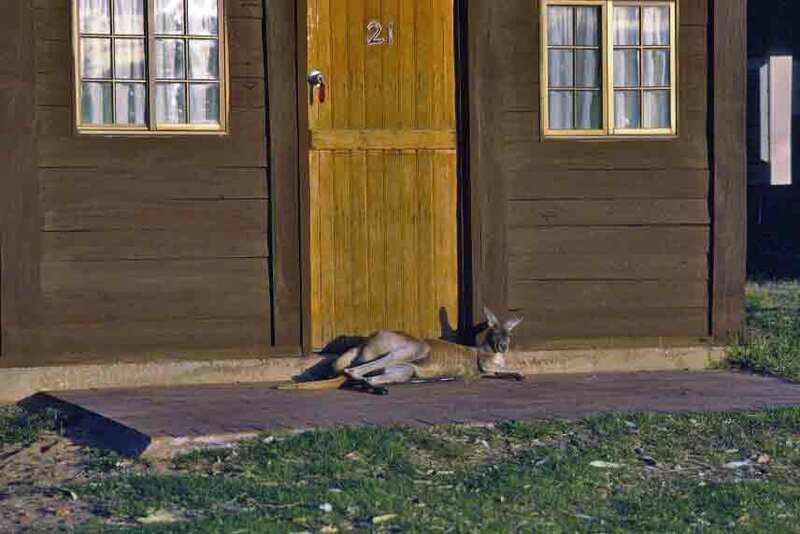 Because of its isolation from the mainland, as well as the very low population level, Kangaroo Island is rich with native wildlife, some of it unique to the island. We drove through the thick bush-land, where openings in the sea of green were filled with wildflowers. The road was unsealed, and the long, straight slash of reddish dirt looked like a fresh cut in an otherwise unbroken mass of plant life. Waves of greenery hung over the edges, seemingly ready to engulf the road at any moment. As we approached the sea, the dense brush gave way to low coastal vegetation springing out of pure, white sand, dotted with small flowers that hugged the ground, trying to escape the wind. We had arrived at Seal Bay. 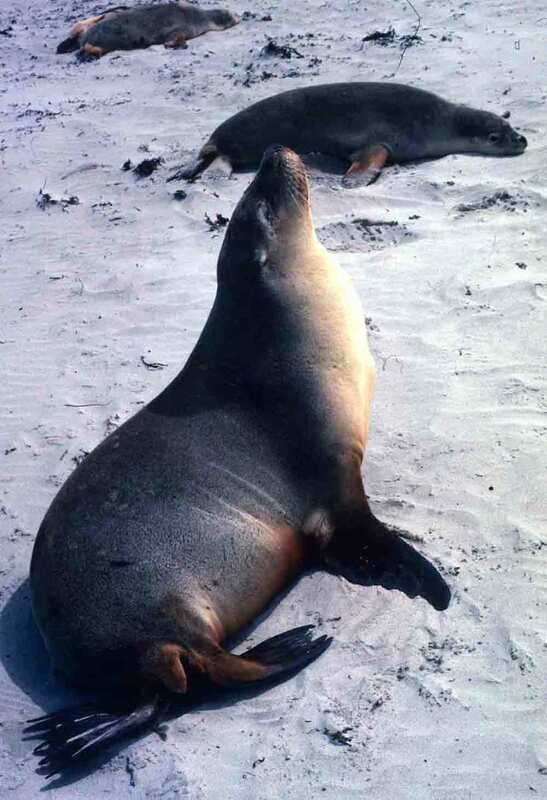 These sea lions are beautiful creatures, with glossy coats and huge, innocent-looking, dark eyes. They are large, but quick. Many of them were sleeping, but several of the youngsters dashed into the surf to play. They splashed joyously, then raced back onto the beach. After a bit of exercise, they would suddenly stop, and just crash to the ground, going from playtime to nap time in a split second. Some of the bulls showed off for our benefit, stretching their necks skyward and assuming regal poses. Because the pups are getting quite large, now, we could get relatively close—their massive fathers feel that the children can fend for themselves, and they aren’t as jumpy as when the pups are younger. However, one makes a point of staying a respectful distance from the very territorial males. Besides, the mothers with their babies are more adorable, even if the pups are nearly full grown. The long climb from out-of-work adventurer to successful freelance writer is outlined, though briefly, in the epilogue to Waltzing Australia. The long “second step” may seem short in the rear-view mirror, but it seemed very long indeed at the beginning, before I had really succeeded—and before I had managed to get back to Australia. I never truly despaired—that might have resulted in giving up. However, there were times I longed for the certainty I had when I was traveling in Oz—not to mention longing for the country itself. I’ve been back to Australia three times since that first six-month trip, but before my second trip, when it seemed that I’d struggle forever to make things work out, I wrote the following little poem. When I was in Australia.